Loyola Chicago's run to the NCAA Final Four is a good time to relate overlooked pioneering histories shared by Michigan State football and the Ramblers' basketball program. Two watershed moments that changed the color of college athletics belong to the Ramblers and the Spartans. Blame the oversights on the differences between history and what distorts into popular history. 1) History tells us Loyola’s 1963 NCAA title basketball team and Michigan State’s 1965 and 1966 national championship football teams changed the faces of their respective college sports with black athletes. 2) Popular history has other schools usurping those pioneering roles despite a timeline of those teams following in the footsteps of Loyola and Michigan State. Loyola and Michigan State can't blame Henry Wadsworth Longfellow – his famous poem with literary license says Paul Revere was alone (he wasn't) on his Midnight Ride and shouted “The British are coming” (he didn't) – but the pioneers can show they have the facts on their side. As David Maraniss, a Pulitzer Prize-winning journalist and biographer, once noted, "History writes people out of the story. It's our job to write them back in." Loyola had four black starters, with Jerry Harkness and Ron Miller from New York and Les Hunter and Victor Rouse from Nashville, Tenn. The Rambler's role in history has been was displaced by UTEP, a school known as Texas Western when the Miners won 1966 national title three years after Loyola's crown. The Miners lined up five black starters against Kentucky’s segregated all-white roster that was coached by a man widely judged racist, Adolph Rupp. With the passage of time the black starters vs. white starters and Rupp cast as the villain took on a life of its own, including a Disney movie, “Glory Road,” in 2006. The five-on-five dichotomy was easy to understand, but it was only a symbol of the times. No less an authority than the legendary and late sportswriter Frank Deford has said as much. Deford made no mention of race in his Sports Illustrated game story. Newspapers followed suit. “At the time, it was not a big deal, especially for people in basketball,” Deford once told the Lexington Herald-Leader. “I mean, the Boston Celtics already were starting five black guys … blacks were already dominating the NBA. Of course, all the Southern schools were white. Those five black Celtics starters were Bill Russell, K.C. Jones, Sam Jones, Satch Sanders and Willie Naulls. Four arrived in Boston from integrated college programs: Russell and Jones were stars at the University of San Francisco when the Dons won back-to-back NCAA titles in 1955 and 1956, Naulls played UCLA and Sanders at New York University. Sam Jones was the only one from a Historically Black College and University, North Carolina Central. Three other black Celtics on the roster during the 1965-66 season were John Thompson, Si Green and Woody Sauldsberry. Pros played in college first, obviously, so college basketball was well on its way changing its face long before 1966. What separates Loyola was coach George Ireland's teams accelerated the pace. Ireland's four black starters eschewed the unwritten rule that coaches were to play two black players at home, one on the road and three if behind. 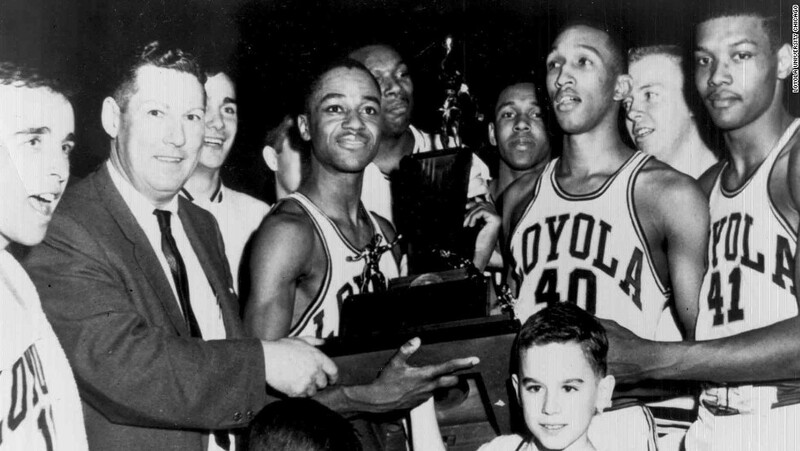 Loyola's 1963 team started for black players, but there were times Ireland had five blacks on the court. On the way to the 1963 NCAA title, the Rambers won five games -- three against all-white teams and two against teams with black starters. Loyola defeated all-white Tennessee Tech in the first round, all-white Mississippi State in the second round and all-white Duke in the Final Four semifinals. Loyola defeated Illinois with one black starter in the Mideast Regional final and Cincinnati with three black starters in the national final. The Loyola-Cincinnati final marked the first time more than half the starters in the NCAA title game were black. By coincidence more Americans saw the game than past NCAA basketball finals. The 1963 NCAA championship was the first final aired with a national TV contract (previously markets bought rights to the game or ignored it based on regional preferences). In the 1964 final, a national audience watched UCLA’s three black stars defeat another all-white Duke squad. In the 1965 championship, UCLA's three black starters defeated Michigan with its three black starters. A pattern was in place long before the Texas Western-Kentucky game. The black athlete had arrived by 1966 in a sport with only five starters and 12-man rosters. The 1966 final was Jim Crow's last gasp from stubborn coaches such as Rupp. It also sparked a transition from an era when many teams had only one, two or three black players on their entire rosters. To paraphrase Winston Churchill, the 1963 game can be looked back upon not as the end, it was not even the beginning of the end, but it was the end of the beginning. In football, Michigan State's 1965 and 1966 teams led by progressive coach Duffy Daugherty changed the face of their sport. Jimmy Raye was the South's first black quarterback to win a national title. Teammates George Webster and Clinton Jones -- both College Football Hall of Famers -- were the first black captains elected by team vote without a white captain sharing the role. Nevertheless, Michigan State lost its place in popular history to the myth that Bryant slyly sought to spur Alabama's Jim Crow fans into accepting desegregation. As the myth goes, he thought a loss suffered at the hands of USC’s integrated roster in 1970 would prompt Alabama fans to agree it was time to recruit black athletes. The myth was kept alive by newspaper stories and later an HBO documentary, "Breaking the Huddle." It made for a good story, but the truth is the game was played on a Saturday night and wasn’t nationally televised. America didn’t wake up Sunday morning accepting the world had changed. What the story line did accomplish is it helped Bryant's legion of apologists transform his legacy from dragging his feet on integration. But the fact is, five SEC schools had integrated before Alabama in 1971: Kentucky, Tennessee, Florida, Auburn and Mississippi State. Even Kentucky's Rupp recruited a black athlete a year before Bryant. Rupp, whose countenance looked like that of Bull Connor, the avowed racist that directed Birmingham, Ala., police to attack protesting black school children with dogs and water hoses, played Tom Payne in Kentucky's in the 1970-71 season; Bryant's first two black athletes took the field in the fall of 1971. A half-decade before USC-Alabama mythology spread, Michigan State’s back-to-back national championship teams dressed 20 black players and 11 black starters; the 1965 team won the UPI national title and the 1966 squad was the co-national champion with Notre Dame as voted by the National Football Foundation. Michigan State's numbers may not sound like much today, but consider the times. In 1967, USC’s national championship team had only seven black players. But by 1972, USC’s national champions numbered 23 black players. Daugherty’s Spartans had shown the way to the Trojans and the nation. The problem is the legend-turned-fact has denied the late Daugherty, Michigan State’s College Football Hall of Fame coach from 1954 to 1972, his true national legacy. Daugherty’s Underground Railroad teams in the Civil Rights era led the path to integration as college football’s first fully integrated rosters. The influence of Michigan State’s ground-breaking teams made college football integration fait accompli by the time USC and Alabama took the field. But just like Longfellow and Paul Revere's Midnight Ride, popular history has confused who did what. Curiously, there is a marker on the Michigan State campus outside Jenison Fieldhouse that recognizes Loyola Chicago's groundbreaking basketball team, but there is no similar recognition for Michigan State's pioneering Underground Railroad football teams. In 1963, Michigan State was the host site for the NCAA Mideast Regional. Mississippi State, with a bye to the second round, was paired off to meet Loyola Chicago if the Ramblers beat Tennessee Tech in the first round. That was a forgone conclusion proven when Loyola won 111-42. At the time, the state of Mississippi prohibited Mississippi State's SEC championship team from traveling to face black athletes. Mississippi State coach Babe McCarthy and his athletes defied the order and surreptitiously left town under the cover of darkness to travel to East Lansing. Loyola beat the Bulldogs 61-51 on the way to winning the regional and advancing to the Final Four. Loyola Chicago-Mississippi State became known as the "Game of Change" in a 2011 documentary. Michigan State honored the 50th anniversary season when the Spartans played Texas Southern at Jenison. A marker was placed outside the fieldhouse. The game was played at Michigan State by happenstance as an NCAA site. The disappointing irony is no historical marker recognizes Michigan State football's contribution that was led by design by Daugherty, the Spartans' College Football Hall of Fame coach.